Many people think a quiche recipe must be difficult to make but our easy ham and cheese quiche will quickly change your mind. Just pour all of the ingredients into an unbaked pie shell, homemade or frozen, pop it into the oven, and half an hour later you are enjoying it. Place ham in bottom of unbaked pie shell; pack down lightly. Top with Swiss cheese. Beat together eggs, onion, mustard and salt. Gradually stir in cream. Pour over ham and cheese layers in pie shell. Sprinkle Parmesan cheese over surface. Bake for 30 to 35 minutes or until set. Cheddar cheese or Gruyere cheese can be used instead of Swiss cheese. Any cheese actually that melts well and is strong and tasty. For great presentation and added taste, add a few thin slices of tomato to the quiche before baking as in the image above. Add more healthy nutrition by adding a few chopped vegetables. Broccoli works well, chopped fine, as do chopped red or green peppers. Omit the ham and you will have a perfect vegetarian quiche. Quiche is an easy dinner recipe, but is also great for lunch, brunch or even breakfast. 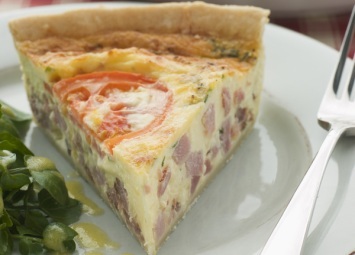 Our ham and quiche recipe is just one of many breakfast and brunch recipes. Find them all here. I love pies and quiches since they are great when our friends come home for dinner. In general, I like to replace the standard baked ham with some jamon iberico de bellota – aka iberico ham or patanegra-. It is true that it is more expensive but the taste of the dish really improves making it way more refined. This is very good, the changes that I made to the recipe are: Instead of a whole cup of cream, I used 1/2 cup cream and 1/2 1% milk. For cheese, I mixed gruyere and cheddar. I’m certain I will make this again.